Ajanta Caves are timeless and exquisitely eternal. Belonging to 2nd century BC, this artistic arc of 30 rock cut caves is blessed with a mystic aura ruling its creative excellence. The work of immaculate discipline, devotion and dedication is visible in the form of wall frescoes, paintings, scriptures and sculptures from Jataka tales along with Sigiriya art from Sri Lanka. These caves also witnessed the glory and waning of the two sects of Buddhism - the Hinayana and Mahayana. Ellora Caves inspire every visitor with its excellence chiseled in rock, making it largest cave temple complex in the world. Located in the north-west Aurangabad, the rock shrines represent three different faiths of Buddhism, Hinduism and Jainism. The linear complex contains Buddhist Chaityas, Viharas or Monasteries, Hindu and Jain Temples. Designated as the World Heritage Site along with Ajanta Cave, these caves present the artistic legacy that has potentials to enrich the future generations. 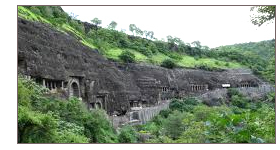 The 12 Buddhist caves at Aurangabad feature 1 Chaityagriha and 2 Viharas. The paintings of Bodhisattvas in these caves form the attraction for the Buddhists. A section of Elephanta Caves feature two Buddhist caves featuring brick stupas. A world heritage site, these caves represent the brilliance of rock cut architecture belonging to the 5th century. Pitalkhora Caves consist of a series of chaityagrihas, one housing votive stupa, one apsidal and single cell and the rest are viharas. The history of the caves can be traced back up to 1st century B.C. There are two main caves. The best known cave is the chaitya (prayer hall) with comparatively large stupa, the other cave is monastery - vihara. Both the caves contain some carvings although are less ornate than later caves. Both caves are facing eastwards so it is recommended to visit the caves early morning, as in sunlight the beauty of carvings is enhanced. There is also a small "Stupa" outside to the right of the main caves. Deekshabhoomi is the religious monument in Nagpur devoted to Buddhism. The site witnessed the conversion of Babasaheb Ambedkar, the father of India Constitution, to Buddhism along with his 3, 80,000 followers. A stupa is built here on the lines of Sanchi.